Names like Alder, Barnes, Barrett, and Palmer were once synonymous as the very name of Aldbourne. Sadly, and oddly a trait that has been proved a curse for our band, a lack of male offspring from our bandsmen has meant the extinction of several of these families from not only our band but of our village as well. Families of course was once the main stay of our band for the greater part of its life or at least until the post war years when the more common ownership of cars and motorbikes by the general public meant they could more easily commute ten/twelve miles of an evening. This meant that they were no longer “stuck” where they lived and that any players from outside the village who were known to be able to handle a brass instrument were now able to be encouraged to come here to play with us. Five Alder brothers were once band members all at the same time. They were eventually followed by two sons of one of these, making theirs a family tradition lasting some ninety years! Take a look at the c1886 photo where all of these brothers can be seen together. Four of them left the village to go to London to work, though Archibald was too young and Joseph soon returned. They were just a few of many villagers that decided to move up to Paddington to work for the GWR. Joseph Barnes Alder is the Euphonium player and leader. James Alder was one of the bands tuba players and William Alder can be seen as the bass drummer. In his later years William played the trombone and can be seen in several photos. In the two census returns of ? and ? William`s occupation is listed as a shepherd and chimney sweep respectively. 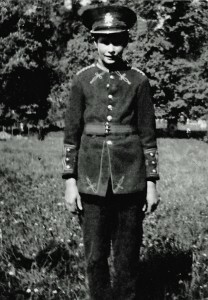 The youngest was Archibald, and though a young cornet player on this photo he also went on to play the trombone in his later years. Frederick Alder, also a cornet player eventually went on to play the tuba. He played the tuba with the Paddington band but on his return to Aldbourne in his later years he played what little percussion that was available. Fred`s sons, Joseph and Fred (confused already?) continued their family banding tradition till the 1970’s. The name Barrett is also one of very long standing. Charles Barrett (Bonnie) and his four sons Eric, Victor, Sidney and Cyril have all been bandsmen but sadly Tim Barrett, Eric`s son is the last of the Barrett clan to play. Another Barrett family was that of Frank, William and John. These brothers, like the Alders, had also gone up to London to work at Paddington and like the Alders had also played with that band. Frank Barrett eventually returned to the village and lived in number two, Willow Cottages. He had played the tuba with us until his departure to Paddington and on his return had worked at Upham as a handyman. He was responsible for starting off in the band his grandson George. George was born to Ester, Franks daughter, had married a lad named Greasley. George once promised his grandfather that he would one day play the tuba like he had and George did indeed do just that, in the time that he spent with a T.A. band. Frank is to be seen on the 1910 photo and also the photo of the Paddington band taken in c1912. George`s grandchildren Amanda and Simon Hancock also once played, It would appear that the two other brothers William and George didn’t return home. George? Alfred Barrett it would seem never played a brass instrument but he did play the clarinet and violin. Fred may have moved to work in Swindon though this didn’t stop him being activly involved with village affairs. In a 1906 church magazine he is mentioned playing a clarinet solo in the church after an evening service and in 1910 he took part in a village entertainment playing a violin solo. He would often join with Albert Stacey in violin duets and one evening they traveled by pony and trap to Wanborough to take part in an entertainment. At the end of the evening one old boy came up to them and said “you two can’t half tickle the necks of those fiddles”. It is probably him pictured on the 1909 photo standing at the rear left with the clarinet. Although the name Palmer has been with the band since its conception it must be explained that though there appears to have been three separate families with the same surname associated to the band it is extremely probable that they all descended from just one source. Two of them have now been connected and so too must be the Barretts (this must happen frequently in such a small community as ours, thus is the way of a village). Brothers Tom and Joseph Palmer were both members for a very long time and between them appear on many photos. Tom first appeared on the 1886 photo and the two can be found pictured from 1886 right through to 1950. A long and loyal length of service for the brothers but for both Tom and Joseph their banding life nearly came to a sudden halt. In 1915 Tom suffered a very serious accident when he was part of a group of sheepshearers who had been on their way to Axford on a horse drawn cart. The horse had taken fright and the cart had been overturned throwing all the men to the ground, two being hurt badly. Joseph Barnes Alder had been badly bruised all over his body but Tom suffered most by having “both his jaws broken”, what a catastrophe to happen to a bandsmen but fortunately for Tom he recovered to continue in his beloved hobby. In 1924 Joseph Palmer cut the tendons of his left hand whilst he was shearing sheep, again a potential hobby stopping injury. Tom`s four sons also became longtime players. Their names were Herbert, James, William and Arthur. Herbert’s son was never a player but became our bands mascot, complete with miniture uniform and Colin , James`s son, was the last of their line to be members. Joe`s two sons were Henry William and Albert were also bandsmen. I do hope you enjoy what will prove to be both a musical and visual experience, in this the life and times of what must be the greatest of all or any of Aldbourne`s fixtures “The Aldbourne Band”. The only two other names mentioned are a Mr Hill and a Mr Thomas Palmer. They would appear to both be members if so Palmer is then the oldest Aldbourne name that still survives as part of the tradition of the band to this day. My son Ian James Palmer and I are both bandsman at the time of writing. Ian is a descendant of Alfred Palmer 1844-1925. Alfred is Ian`s great, great, grandfather and was probably a founder member of his band but not found mentioned by name until the 1880`s. A baker and grocer, he was also a bell ringer for some fifty years and it was he who taught another bandsman, Thomas Arthur Palmer, that art. Alfred often appeared in village entertainments, occasionally with his brother James when they would perform songs together. In 1889 Alfred was fined the sum of one Guinea for being cruel to a horse. It was being used to plough when it was in fact too old and frail for that kind of work. Alfred told the Marlborough court that as the horse had been unable to do the work for which it had been purchased, that it had been despatched from this life by his brother James. Alfred may not have been able to afford to purchase a fit and healthy horse but that same year he purchased for the sum of £200, from the estate of Stephen Palmer dec, a dwelling and grocers shop. Alfred didn`t have a lot of luck where horses were concerned. In 1916 he was out delivering bread to Alma farm at Preston when a passing military wagon so frightened his horse that it bolted and as a result broke its leg. Brothers Arthur and Cyril Palmer were from another line of the Palmer clan. Arthur’s claim to fame is that he once occupied the positions of principle cornet and principle euphonium. His playing prowess is still recognised as being of the finest quality. Cyril`s playing career finished with him as a G trombone player. He was one of the few who decided to go with Joe Alder over the hill to play with the Swindon GWR band. This is one family that still continues as playing members with Arthurs grandson Ian now a member of the band. Cyril decided to remain a bachelor and so joined the ranks of the bandsmen who didn`t produce any future players for us. Barnes is of course another of our more famous village names. This family has had members since Thomas Dixon Barnes joined in the early years of this century. Tommy was for most of his time a tenor horn player and they as a family dominated this section of the band for many years. Robert and James, his two sons were both capable tenor horn instrumentalists and their children Terrence and Lionel respectively followed them. Today see`s Lionel`s son Luke as one of our percussionists. The name Jerram will also be long remembered with all four brothers members from the first half of this century. Their names were Alfred, Wilfred, George and Francis. Like the Barretts only one of their line now remains. Gerald, son of Francis is the only surviving Jerram still playing, though in his retirement he now gives his services to the Ramsbury band. Sheppard is yet another name that has been very much part of the past of Aldbourne village. What with our first ever bandsman being a Sheppard its important to note that there is still a member of that name with us today. Henry Brind Sheppard was the second with that name, his son Frederick came next, Harry his grandson became the bands principle cornet in the early fifties with James his son joining in 1995 on tuba, complicated is it not? I must just point out one thing that springs to mind not only about our band`s genealogical tree but of our village too. You must remember the next time you run down (verbally that is) someone from Aldbourne to another villager that they are probably related one way or another to the person you are running them down too. Worrying isn`t it?